They say beauty is only skin deep. A proverb that a "beautiful" appearance does not equal a beautiful person. I believe beauty is a philosophy. To me, beauty is more than an aesthetic. It's more than what is seen, it is a way of life. It is who you are. It manifests in everyday life in the way you do small things, and the small considerations you make. It's self-respect and it's respect for others. Beauty is the unwavering focus of caring for yourself free of judgment and external validation. Beauty is defined differently by our individual perspectives and where we find meaning - what makes us happy and what makes us feel beautiful. My friend Mallory finds beauty in hula-hooping. She loses herself in the moment. Twirling and spinning to her favorite music outside in the sunshine. In that moment she is only there. She is vibrant and alive, and that, to me, is beautiful. In this article, I would like to share with you some ways I express myself. My so-called "life hacks" to feeling beautiful. Apply them to your life based solely on their benefit, or if you find yourself lost from your beauty, let these help you find your way back. Also known as earthing, or grounding, this is something I try to do several times a week. Mostly when I take my dogs to Zilker Park. I kick off my shoes and run around with them, barefoot. The earth is full of energy, as are our bodies. Free radicals (positively charged electrons) build up in the body, causing damage to cellular proteins and DNA. Exposing our body directly with the earth (abundant with negatively charged electrons), balances this out and restores us. Think of yourself as a lamp, and the earth as the outlet. The earth's electrons provide essential antioxidants that restore the body and reduce inflammation. For most of our evolutionary past, we walked barefoot and slept on the ground. The energy within the earth is free-flowing and "provides a subtle electric signal that maintains health and governs the intricate mechanisms that make our bodies work." Grounding is also known to improve mood and sleep, accelerate tissue repair and wound healing, speed up recovery from workouts, help you lose weight, and reduce the symptoms of PMS. If your first thought to this was, "I can't even do one handstand!" Let me stop you right there. This article is not about limiting or discouraging yourself. It is about living beautifully. You must believe in yourself. Perhaps you haven't done a handstand in bazillion years...that's ok. We all start somewhere. Let's talk about why handstands are so beneficial, and then I'll give you some advice on where to start. This girl is nuts, but these are my handstand goals right here! Handstands are a weight-bearing exercise. Weight-bearing activities exercise not only the muscles and joints but the bones as well. Women, I'm talking to you here! Worldwide, 1 in 3 women over age 50 will experience osteoporotic fractures. Handstands stimulate the endocrine system. By increasing blood flow, the thyroid gland better regulates metabolism and hormone production. Handstands also build upper body and core strength, as well as improve wrist and grip strength, reduce stress, and improve balance. Start by holding a handstand against a wall for 5-10 seconds. Do sets of 3 and grab a partner to help spot you. Work your way up to one or two minutes. Frequency is the most important here, so practice often and watch your body improve! Earlier I brought up our evolutionary history with sleeping on the ground and walking barefoot. That also entailed being in constant contact with nature. Keeping plants around the house and in your workspace will increase productivity, reduce stress and anxiety, and genuinely make you happy. Caring for houseplants engenders a positive response from the responsibility of caring for something besides yourself. Houseplants reduce indoor air pollution and remove volatile compounds such as benzene, formaldehyde, and toluene from the air. Lack of greenness increases violence. Who knew plants could be so powerful? Dancing is a form of self-expression and it is art. Dancing is not right, nor wrong, it just is. It is unique, and it is you. I like to dance alone in my bathroom. Sometimes I grab my dogs and I subject them to dancing with me. I am certain they love it. Chose to dance wherever you like, I just prefer my bathroom. I dance in the morning when I'm getting ready for my day and I dance when I'm feeling like a grumpy cat. It clears my head and makes me realize how much I have to be grateful for. Dancing releases endorphins and reduces stress and anxiety. It can also diminish anger and aggression. Dancing boosts confidence and reduces depression. Studies have even shown that dancing prevents the onset of dementia. A 21-year span study revealed that the participants who danced frequently were 76% less likely to develop dementia. If that doesn't make you want to dance more, then I certainly don't know what will! The average American spends 9-10 hours sitting in a chair, daily. This frequent activity increases the risk for heart disease, cancer, and osteoporosis. Sitting regularly negatively effects posture and spinal alignment. It decreases circulation and increases weight gain. An under simplification of the harmful effects of sitting too frequently, but more than reason enough to get up and move. We are not just made to walk, but we are obligated to do so. It's no wonder that "67% of U.S. office workers wish their employers offered them desks that could be adjusted so they could work either seated or standing." Walking regularly increases circulation, improves posture, helps maintain a healthy weight, improves the respiratory system, and boosts immune function. Studies have shown that walking just 2 minutes out of every hour will increase lifespan by 33%. What?! Sign me up, please! Walking also protects the joints and eases joint pain. Walking strengthens muscles and lubricates joints, keeping them (and you) healthy and happy. Did you know that when you walk your brain communicates with itself? Yep! Walking is good for brain health too. Walking helps the brain process and develop a game plan for stressors affecting our lives. It also decreases the chances of developing Alzheimer's and improves memory. Unsure of how to incorporate more walking into your life? Start by parking away from the entrance of buildings and take the stairs, rather than the elevator. Think walking is boring? (Rolls eyes at you.) That's because you're constantly overstimulated - you've forgotten what it is to just be. Make walking social if you must. Invite a friend. Bring your headphones and listen to a podcast. Read a book while on the treadmill. Make it interesting and make it routine. Your body deserves it. Of all of my happiness hacks, this one gets the most push back. People seem to have this very specific idea of what meditation is. Images of light chanting in a cloud of incense while sitting with legs crossed and eyes closed is exceptionally common. Sure, that's one way to meditate, but it is not the only way to meditate. That's the best part - there is no single way that's right. Let's discuss the benefits of meditation, and then I'll give a few recommendations on how you can incorporate the practice into your life. Meditation improves working memory and the ability to sustain attention. People who practice meditation are 5X more likely to behave compassionately towards others. Mindfulness improves mood. It is proven to be as effective as anti-depressants at treating depression, without any negative side effects. Anxiety affects 1 in 14 people worldwide. Practicing mindfulness (meditation) decreases anxiety and reduces stress. Meditation improves sleep quality, not only helping you fall asleep quicker and easier but helps you stay asleep through the night. While this is close to the standard "vision" of what meditation is (minus the incense stuff), I really enjoyed that it was guided. Andy (one of the founders) speaks to you frequently at first, guiding you to be mindful of your body, where you are feeling sensations, thoughts that may be drifting into your mind, and encourages focus when you drift. What I learned through using this app is that meditation is not about control. It's not about forcing yourself to remain perfectly still, or about being thoughtless during the process. That's impossible, and can be daunting to a beginner. Meditation is not about control, but it is about not being controlled. When a thought drifts into your mind, rather than becoming anxious or uneasy because of it, meditation teaches you to acknowledge it, and let it go. It teaches you to remain in the moment and to understand that the only true power we have is over our mind, our ideas, and our actions. Not sure that's the right style of meditation for you? Try these. Still not convinced? Try my next step. Every month I send 3 letters to different people, thanking them for something. Sometimes it's who and what they are in my life, other times it's a rare quality they have. Every time, though, I feel completely and utterly full of bliss. If you live in America or were born here (like I was), then you are among the 300+ million people that have every single reason to be grateful for every single thing. Access to internet. The right to worship. The right not to worship. Required education for children. Freedom of speech. Clean drinking water. Equal rights for women and all ethnicities. Constant electricity. Hot water. Toilets. Automatic washing machines. Hairdryers. Eating utensils. Unlimited water usage. Air conditioning. Heaters. Automobiles. Stoves. Microwaves. Refrigerators. The list is endless, but I'll stop there. Practicing gratitude shifts you from a scarcity mindset to an abundance mindset. Focusing on what you have, rather than what your life is lacking, builds a stronger immune system, improves sleep, lowers blood pressure, decreases feelings of loneliness, increases optimism, and creates a stronger sense of self. Scarcity mindset operates under the idea that there is only so much to go around. If someone else is successful, you won't be successful too. Scarcity mindset breeds insecurity, jealousy, resentment, and victim mentality. Not exactly the epitome of a happy person, is it? Abundance mindset, on the other hand, cultivates positive feelings towards others, as well as oneself. Abundance mindset understands there is more than enough to go around. You simply must do the work. Abundance mindset breeds confidence, worthiness, generosity, and trust. Keep a gratitude journal. Every morning and evening, write 3 things you are grateful for. Even if it's only for that lamp you adore. Say thank you to everyone. Even if someone has just said something rude or offensive. Thank them for their honesty. Tell people how you feel more often. Express your love and affection. When you have a negative thought, find the positive and change your thinking. When was the last time you remember being complimented by a stranger? Perhaps it has been a while, but it made you feel special undoubtedly. The power of community and society is curious and intriguing. No matter how much we may claim to "not care what others think", it is biologically ingrained in us to seek approval from others. Living and working in groups is how we have survived this long and remain at the top of the food chain. Compliments are powerful little gifts that let another know they are worthy of notice. Studies have shown that compliments spark creativity, build trust, and creates positive energy between the giver and receiver. Next time you're out shopping, eating, or refueling your car, give a stranger a compliment. Part of the job as an esthetician is to educate on the risks of excessive sun exposure - keyword being excessive. I am not one of those skin care professionals that believes you should avoid the sun at all costs. In fact, quite the contrary. I recommend regular doses of sun exposure - in moderation. Sun exposure is the best way to load up on Vitamin D.
The world we live in now is vastly different from what our hunter-gatherer ancestors lived in. There are pollutants and toxins floating around the air, indoor air that is higher in chemical composition than outside, and a hole in the ozone layer threatening to harm our healthy skin. With all that going on, I strongly recommend wearing a physical SPF during your outdoor activities. The face, neck, chest, and arms are areas frequently exposed to the sun and risk overexposure and UV damage. So just because I'm saying to get some Vitamin D exposure, the natural way, that doesn't mean I'm saying toss out the SPF. Over 1,000 different genes that govern nearly every tissue in the body is thought to be regulated by Vitamin D. Sun exposure is vital. The majority of those with Vitamin D deficiencies are caused by lack of sun exposure (an annual 3.3 billion disability-adjusted life years are affected). Moderate sun exposure builds healthy, strong bones kills bacteria, clears skin disorders such as psoriasis and eczema, increases blood oxygen levels, and cures depression. When I was in high school I could do the splits up against a wall. My squad members helped push me to get a deeper stretch. Insane. What I wouldn't give to be able to do that now. So, to get me back to that goal, I've incorporated stretching into my daily routine, as well as practicing yoga a few times a week. Here are some awesome reasons why you should stretch more too. Not only does stretching increase flexibility and range of motion, it's also a form of exercise. Stretching increases blood circulation, invigorates the mind, improves fine-muscle coordination (reduces falls), relieves joint and muscle pain, and alleviates mental and physical tension (which reduces stress). Yoga is about connecting with the body on a spiritual, mental, and physical level. The healing powers of regular practice are next to none and the ultimate reason to incorporate yoga into your lifestyle. Studies have shown that practicing hatha yoga (even just for 20 minutes) improves cognitive function, increases focus, and boosts productivity - but that's just the tip of the iceberg. Yoga is not just about stretching and sweating. It's about detoxifying the body when the internal temperature has risen (which kills pathogens), while your breathing is controlled (which improves respiration and lung elasticity), with an increased heart rate (which builds strength and cardiovascular endurance), during a mobility posture (intended to elongate muscles, open joints, and alleviate ailments). Yoga prevents cartilage and joint degeneration, protects and aligns the spine, stimulates lymphatic drainage and boosts the immune system, regulates the adrenal glands, improves digestion, fights depression and increases self-esteem. Personally, I practice Bikram yoga (a form of hot yoga). Bikram is more intense than the standard flow yoga, but the benefits are profound. There are countless studies currently underway proving the benefits on depression, diabetes, heart disease, and a multitude of other ailments. Bikram yoga is a 90-minute session in a 105-degree room with 26 set postures. The first few times I ever practiced, I had a really hard time staying in the room. The more I practiced though, the more I learned. The key is to finish the session in the room in whatever manner possible. During my third or fourth class, I attempted to pop outside for cool air, but my instructor wouldn't have it. She very gently instructed me to lie back down on my towel in savasana. Since that day, whenever I feel overwhelmed in the class, I simply lie on my back in Savasana and regain control of my breathing. When my heart rate has lowered, I resume the positions with the class. The thing about the body (and practicing this style of yoga specifically) is that every single practice will be different. One day you'll feel the tension in the hips, another the elbows will have pain, or the lower back or the temperature will take more of a toll on you. It doesn't matter how long or how often you practice, every single person experiences fluctuations and that's perfectly normal. Half Moon Pose (Ardha Chandrasana) - corrects postural issues and lower back pain. Hands to Feet Pose (Pada Hastasana) - tones abdominal organs and spinal nerves and improve bowel activity. Awkward Pose (Utkatasana) - helps cure slipped discs and alleviates arthritis in legs. Eagle Pose (Garurasana) - opens 12 major joints and promotes the health of the central nervous system. Standing Head-to-Knee Pose (Dandayamana Janushirasana) - mitigates diabetic disorders and flushes out ovaries, uterus, and abdominal organs. Standing Bow-Pulling Pose (Dandayamana Dhanurasana) - enhances spinal elasticity and stimulates cardiovascular system. Balancing Stick Pose (Tuladandasana) - provides full spinal relief and increases cardiovascular circulation, particularly in the blood vessels of the heart. Standing Separate-Leg Stretching Pose (Dandayamana Bibhaktapada Paschimottanasana) - cures and prevents sciatica and mitigates certain central nervous system diseases. Triangle Pose (Trikonasana) - improves every joint, muscle, tendon and internal organ, and regulates hormonal levels. Standing Separate-Leg Head-to-Knee Pose (Dandayamana Bibhaktapada Janushirasana) - stimulates thyroid and aids in immune system functionality. Tree Pose (Tadasana) - increases the flexibility of ankles, knees, and hip joints. Toe Stand Pose (Padangustasana) - alleviates rheumatism and arthritis in hips and all leg joints. Corpse Pose (Savasana) - circulates freshly oxygenated blood and balances blood pressure, respiratory rate, and brain waves. Wind-Removing Pose (Pavanamuktasana) - improves hip joint flexibility and balances the hydrochloric acid in the stomach. Bikram Yoga Sit Up Pose - realigns the spine and massages abdominal organs. Cobra Pose (Bhujangasana) - targets lower back muscles and pain, alleviates menstrual problems. Locust Pose (Salabhasana) - targets upper back, cures tennis elbow, stimulates circulation. Full Locust Pose (Poorna Salabhasana) - increases the strength of spine and functionality of liver and spleen. Floor Bow Pose (Dhanurasana) - opens rib cage, allowing maximum expansion of lungs, enhances digestion and opens shoulder joints. Fixed Firm Pose (Supta Vajrasana) - heals weak, injured knees, and stretches diaphragm and hip joints. Half Tortoise Pose (Ardha Kurmasana) - increases hip flexion, stretches spine and shoulders, stimulates the pituitary gland. Camel Pose (Ustrasana) - full backward bend, improves neck flexion, stimulates the nervous system, and promotes toxin elimination. Rabbit Pose (Sasangasana) - compresses and nourishes the thyroid gland and alleviates the common cold. Head-to-Knee Pose (Janushirasana) - promote proper kidney function and circulation to bowels. Stretching Pose (Paschimottanasana) - increases the flexibility of the ankle, knee, hip joints, and sciatic nerves. Spine Twisting Pose (Ardha Matsyendrasana) - compresses and stretches the full spine from top to bottom and promotes elasticity, flexibility, and circulation to the spine, nerves, and tissues. Bikram begins and ends with a breathing pose, which is not listed above. The standing and sitting breath poses promote respiratory function and improve the elasticity of the lungs. Bikram is my preferred method of yoga, but any will do. No matter what style you choose to incorporate, the mountain of benefits is endless. If you have not practiced in some time, perhaps start with 5-10 minutes of daily stretching and then incorporate some classes from time to time. 26% of Americans say they haven't read a book in the past year. That's 3X the amount compared to polls taken in 1978. A sad statistic if I say so myself, considering the accessibility to books and articles has increased dramatically with the technological advancements we've experienced. Reading is the single-most important factor in building the foundation for success. Reading expands vocabulary, making you a better conversationalist and negotiator. Reading improves memory which advances your debating and story-telling skills. Reading improves analytical thinking skills, which can literally save your life in sticky situations. Reading stimulates the mind and keeps the brain sharp, which can stave off neurological diseases such as Alzheimers and Dementia. Studies have shown that reading books of fiction improve empathy and understanding while reading self-help books can ease depression. Sound awesome, but not sure you have time to read? 1. Read books you actually enjoy. Maybe this means you only read romance novels or thrillers. Whatever, a book is a book. Don't be afraid to quit reading something you aren't enjoying. Our time here on earth is so precious, don't waste it reading some crapola you don't love. I give a book 2 chapters. If I don't thoroughly enjoy it by then, I move on. 2. Bring your book with. There are hidden minutes everywhere you go. Instead of picking up your phone and wasting your life on mindless social media scrolling, grab your book and get a few minutes in. Stephen King has been caught countless times reading in off-kilter places (like at Red Sox games). He attributes all his success as a writer to reading and recommends getting in 5 hours a day to follow his path. This seems like a lot to many, but this mere suggestion is what helped him sell over 350 million books. You can find extra time while waiting in line at the grocery store, the bank, post office, or while you fill up your gas tank. 3. Invest in a Kindle. Even if you are traditional and prefer the feel and smell of real books, this is not to scoff at. I used to be anti-kindle myself. Until I got one. For starters, they weigh less. The average paperback book weighs almost a pound, while a Kindle weighs just over 7 ounces. Reading several books at a time? Now you've got pounds of books to carry around. A Kindle can house thousands of books, without ever increasing in weight. You can preview samples of new books on a Kindle, rent books from the library, share books with friends and family, highlight sections and then pull up only highlighted sections, look up words and play vocabulary building games, and download books over wifi access for free. I'm not saying throw out your paperbacks. I personally own more books than I do clothes, but I take my Kindle with me everywhere so I can read anything I want, anytime I want. Thinking of what book to read next, or right now, takes up mental space and energy. Make a list of books you want to read or have heard are good and start crossing them off the list. This will not only free up some mental space but will also make you feel accomplished as you see the list evolve and more books get checked off. 5. Read more than one. If you only find 30 minutes every day to read, it's going to take you some time to tick off that list. Are you going to be interested in the same single book for several weeks? Perhaps not. Keep a few books going at one time so that you never find yourself bored or stagnant in your reading. I am usually reading three books at a time. One fiction, one non-fiction, and one audible (fiction or non-fiction). 6. Get audible (listen to books). The average American reads 12 books a year. I read over 50 books in 2016 and I owe it all to audible. How many hours a week do you spend driving around town? Rather than being peeved at the atrocity of traffic here, use that time wisely and listen to some books. You can test the book beforehand to see if you will enjoy the narrator. If not, choose a different audible and read that other one in person. This can be a local or virtual thing. Oprah Winfrey has a book club (which I totally plan to join). This not only makes you a part of something and will motivate and encourage you, but it also takes all the work out of it. The best way to retain what you read and enjoy it after you've finished it is to teach others about it. This is biologically ingrained in us - the desire to teach and better others. This not only satisfies that need, but you may learn something amazing from your audience in return. Another benefit of both kindle and audible (if you have a membership) - books are heavily discounted. I buy most of my books through Amazon, rather than big chain bookstores because the prices are always better. You can also hit up Half Price Books, Goodwill, or check them out from the library. All of which are super cheap or free! 10. Make it a priority. At the end of the day, this is really the only one that matters. If you're constantly saying things like, "I just don't have time to read," then yeah, you won't ever start reading more books. It starts with your mind frame and making this a priority. I cannot put enough emphasis on how imperative reading is to personal growth and development. You just won't get all the places you want to go if you do not read more. This is not an attack or assault by any means, this is just my personal belief because I know how vastly different my mind works when I read and when I don't read. There is absolutely no reason why you can't get in at least 30 minutes a day of reading, I don't care who you are. Elon Musk has 6 kids, a wife, and is running 3 of the most innovative companies this country has ever seen and he makes time to read. If he can, you certainly can too. Change your mind frame and you'll change your life. It's that simple. When I was a little girl, I remember a story my step-mom told me about her daddy-daughter dinners when she was a little girl. Whenever she and her father would attend dinner together, she would look for a single diner and her father would pick up their bill. I don't remember why this specifically tugged at her heart, but I do remember what it conveyed to me. Generosity matters, especially to those who haven't earned it. That's what it's all about, isn't it? Being a part of something where expectation does not exist. That, my friends, is truly beautiful. Believe it or not, there is scientific proof of "paying it forward". Studies found that witnessing a single act of kindness was likely to create a cascade of generosity in its wake. When you make a small contribution to another (buying food or coffee), others are more likely to follow your example. Helping others increases life expectancy, boosts happiness, lowers blood pressure, and gives a sense of purpose and fulfillment. This is something I've been thinking about a lot lately. My late my best friend gave the best hugs. The. Best. Hugs. She was forward facing, arms wrapped around me, tight grip, and held that position for long periods of time. Hugging this way is important and we don't do it enough in our culture. Heck, we don't touch enough in our culture. Period. Look at how the French greet each other (even strangers), or how about Columbians (even the men)? They embrace each other wholeheartedly. You can physically feel the love and energy between them simply from witnessing it happen. 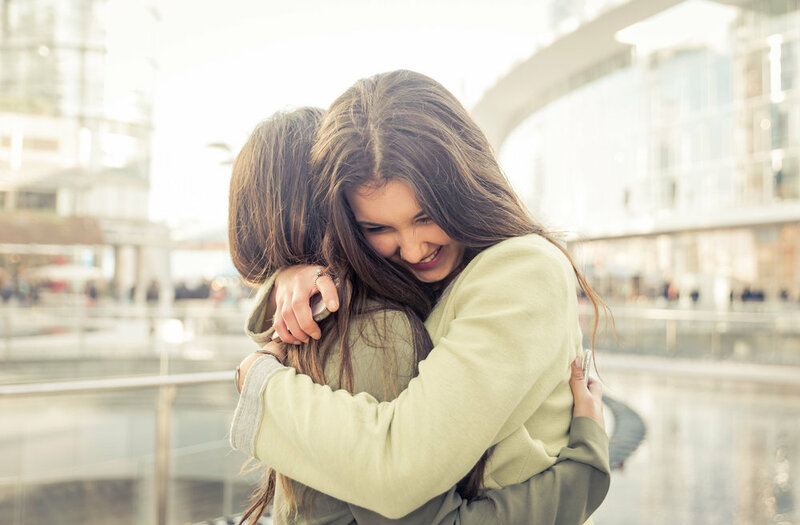 Genuine hugs boost oxytocin and serotonin levels, heal sickness and disease, ease feelings of loneliness and depression, and reduce stress and anxiety. There is a circle of energy around every human and when you hug another with hearts and sternums pressed together, you exchange feelings over a bioenergetics field which builds trust and creates empathy and understanding towards one another. Hugging changes the skin conductivity among one another and balances the parasympathetic nervous system. Hugging also promotes dopamine production (which alleviates depression) and reduces stress (which boosts the immune system). One of my personal goals for the rest of forever is to hug more and hug better. If you are a client or friend of mine, this is your warning. I will now be a hugging machine! I hope you find benefits and uses from these beauty hacks, and if you are ever in need of a hug, or any support, I will be available. If you have any questions or comments, please do so below!